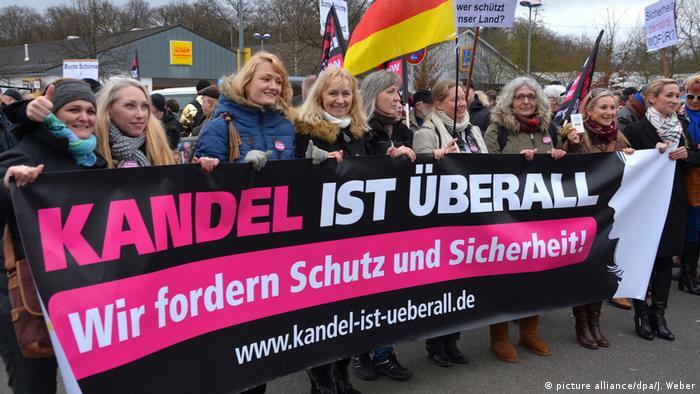 "We want security," said protesters in the town of Kandel, where a young girl was allegedly killed by her ex-boyfriend. Town officials have spoken to DW about sentiment in the town. The small German town of Kandel stood divided on Sunday as 1,000 protestors (in a town of only 8,500) gathered in the main square to stand either for or against refugees one month after a local teen was allegedly killed by her ex-boyfriend, an Afghan asylum seeker. Banners reading "Safety for us and our children" stood across from others saying "Stand up against racism," as tensions rose in the packed streets. Local authorities told DW that the majority of anti-migrant demonstrators were not locals but had instead travelled from across Germany to Kandel ahead of the protest. Fifteen-year-old Mia V. was stabbed to death with a kitchen knife in front of a drugstore on December 27, allegedly by her former boyfriend, also 15. The boy arrived in Germany as an unaccompanied minor in the spring of 2016. He was moved to a juvenile care institution in the state of Rhineland-Palatinate, where Kandel lies. After leaving that facility in September, he was put in the care of a supervised youth living group. According to senior prosecutor Angelika Möhlig, the boy had been in a relationship with the girl for several months before she broke up with him at the beginning of December. Both Mia and her parents had gone to the police about his harassing and threatening behavior. Last week, the authorities elevated the charges against the suspect from manslaughter to murder. The shocking death in the wealthy town near the French border was reminiscent of a similar incident in the southern city of Freiburg, where an Afghan refugee is on trial for murdering a medical student. Germany took in hundreds of thousands of refugees in 2015, citing historic responsibility for promoting human rights. However, in the intervening years, Chancellor Angela Merkel has come under some criticism for her decision. A preliminary coalition agreement between her conservative party and the center-left Social Democrats would see the number of asylum seekers allowed in per year capped at 220,000. Despite the apparent anti-migrant sentiment on display in Kandel, a spokesman for the town's local authority told DW that the town had not received any complaints or concerns over the safety situation in the town. In fact, only a "small minority" of those who took part in the anti-migrant protest were from Kandel. Sebastian Burkhard, a police spokesman in the district of Landau in Rhineland-Palatinate, where the town is located, also confirmed this. "Kandel was used a platform for people from elsewhere to express a certain view and to protest" Burkhard said. "It's not a movement that stems from the people of Kandel themselves. This is not a point of view that's widely shared by those who call the town home."